On a rooftop overlooking an industrial complex, the Turtles are keeping the Kraang under watch. 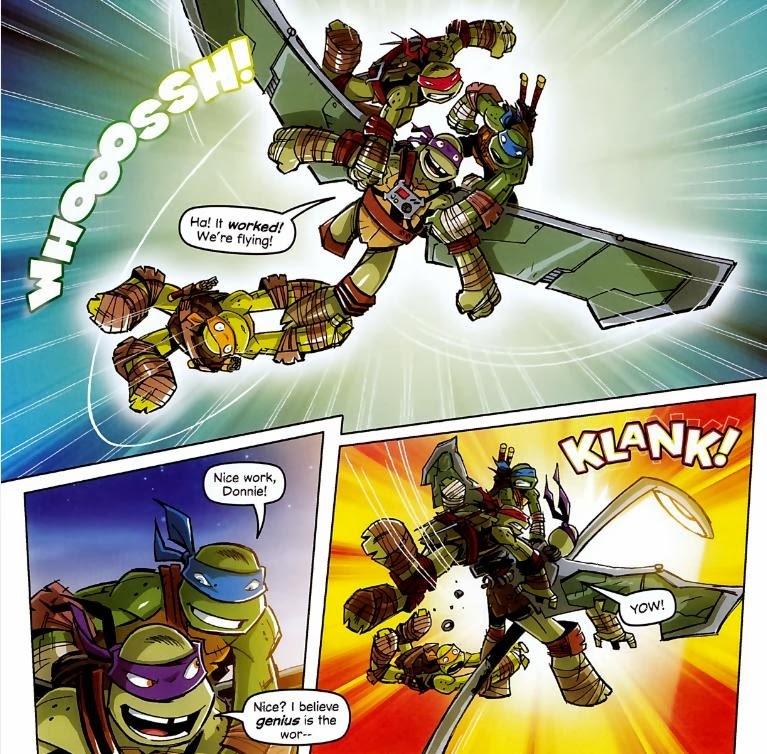 Donatello thinks this is the perfect opportunity to try out his new Stealth Wing jetpack. The others chide his inventions for rarely working, but Donnie insists he’s got his calculations right. While playing with Don’s staff, the blade pops out and nearly slices Mikey in the face. Don awkwardly chuckles that he over-lubricated the blade mechanism then leaps off the roof. Unfortunately for Donnie, the Stealth Wings get jammed and fail to deploy from the pack. He calls for help on his TPhone, but it’s too late. Plowing through a flag and bouncing off an awning, Don lands unconscious on the roof of a Kraang truck which proceeds to pull out of the complex. The Turtles chase after their brother, using the GPS signal from his TPhone to track him. The truck arrives at a Kraang skyscraper facility and the alien robots notice the Turtle on the roof. They carry Don off to level 62, intent on dissecting him. 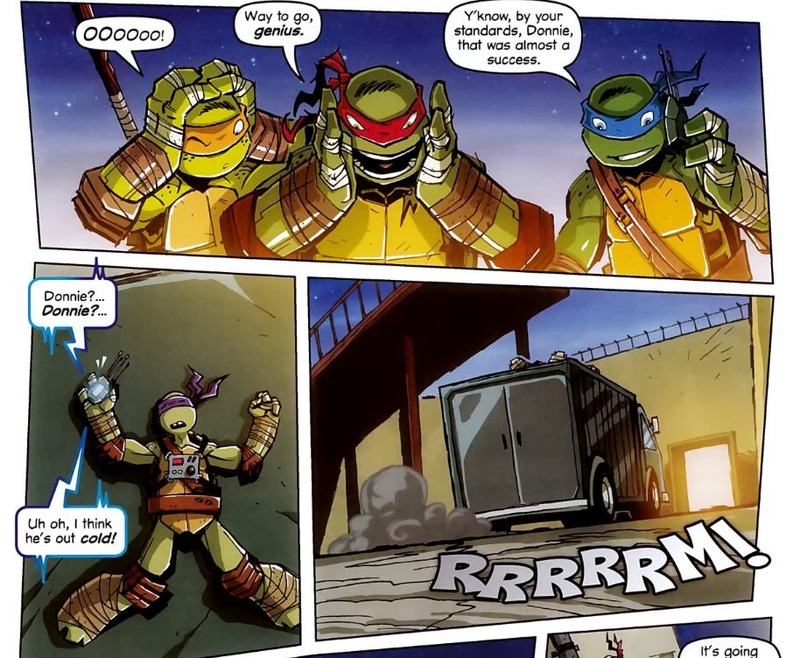 The other Turtles arrive at the skyscraper, but find Donnie’s TPhone still on the roof of the truck. 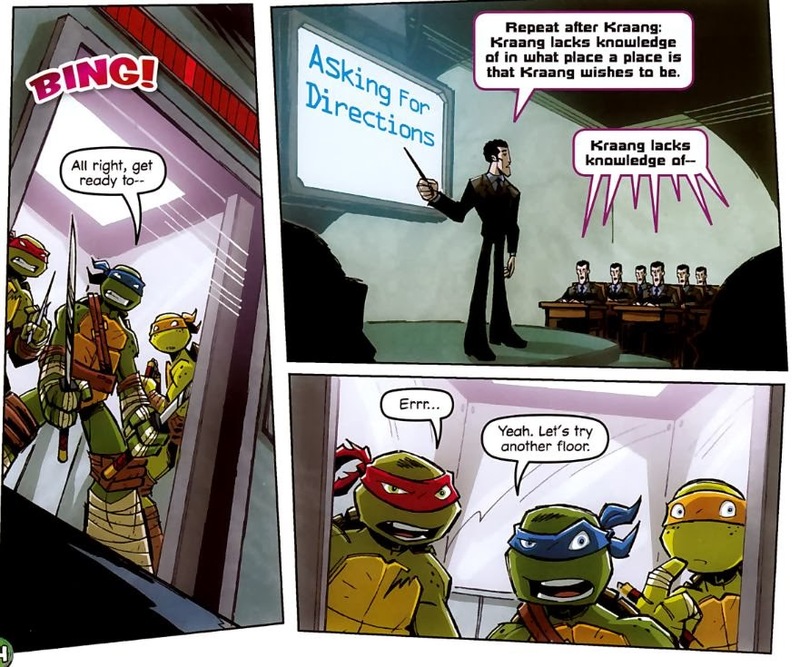 With no way of knowing what floor the Kraang took their brother to, they’ve no alternative but to check them all… one at a time. They pass a Kraang speech orientation seminar first, then a mutation study lab where a giant three-headed, tentacled blob-monster dwells. Eventually, they arrive in the dissection lab. Donnie has just woken up, strapped to a table, and the Kraang are preparing to cut him open. The Turtles make short work of the Kraangdroids and free Donnie, but find their route of escape blocked. The Kraang have arrived through the elevator with reinforcements: the blob-monster. With no other means of escape but the window, Donnie tells them all to hang on and he’ll carry them to safety on his jetpack. They remind him that the thing doesn’t work and they’ll all get killed. Donnie thinks for a moment and realizes that if the Stealth Wings jammed, that just means they needed some lube. Remembering that he over-lubed the blade mechanism of his staff, he uses that excess lubricant to grease the wings. The blob-monster closing in, the Turtles have no choice but to trust Donnie and grab onto him as he jumps. The Stealth Wings deploy and the jetpack works perfectly… until Donnie flies directly into a lamppost and sends them all careening into an open dumpster. 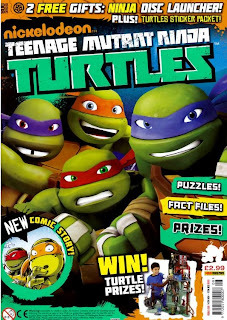 *This story is continued from TMNT Magazine (Panini) #7. The story continues in TMNT Magazine (Panini) #9. *Donnie’s jetpack first appeared in the episode “The Mutation Situation”. 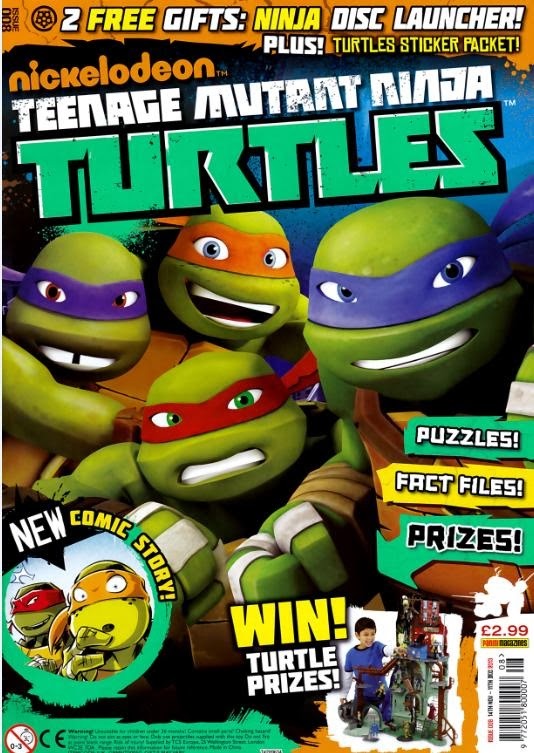 As much as I’ve been enjoying Panini’s TMNT comics, they are a bit guilty of overusing the Kraang as antagonists. Their goofy speech patterns make them fun to read and their various machinations give them a variety of schemes to thwart, but they’ve so far featured in 5 of the 8 issues of this magazine. It’d be nice to see the other villains get a little more attention, is all. That said, this was another tightly scripted story littered with some good gags. This is one of those cases where I wish the Panini comic had more page space in the magazine, as the bit where the Turtles check out each floor one-by-one had the potential for a lot of great sight gags. 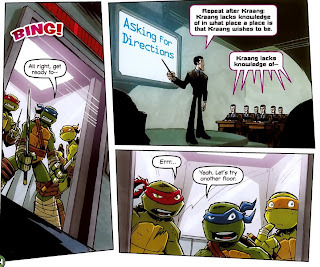 In the end, we only got two, but they were both pretty funny (I especially liked the Kraang giving English lessons). Each floor investigated was punctuated with a scene of Donnie on the dissection table and the Kraang getting closer and closer to filleting him (their redundant speech patterns being the only thing delaying his vivisection). It was a good balance of suspense and humor, which is one more reason why I’d have liked to have seen the gag extended. But hey, they only have so much room to work with; I understand. Another good story, I just hope to see a little less of the Kraang in the future.